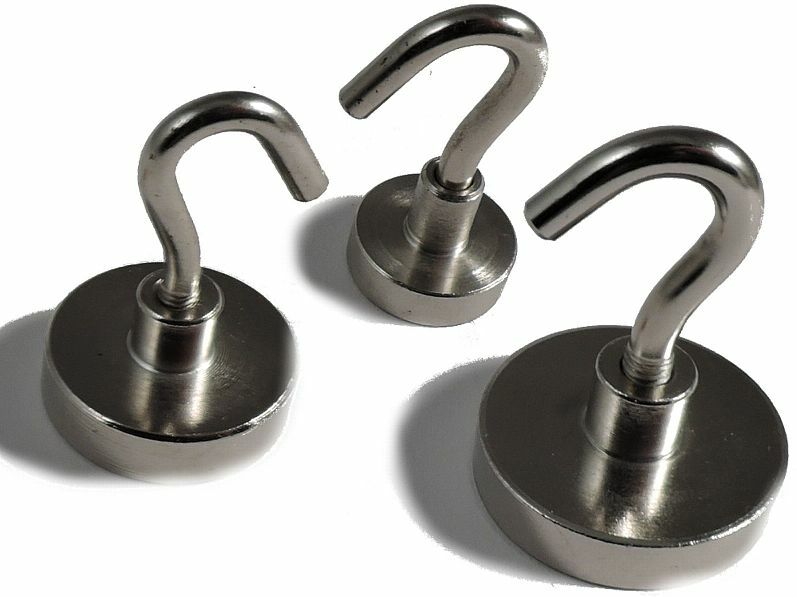 Our rare earth holding pot (threaded hook) magnets are excellent for holding cabling out of the way. 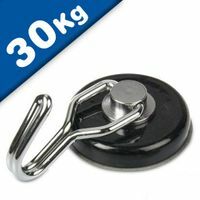 These neodymium holding pot magnets are high strength rare earth magnets in a mild steel cap for extra protection against chipping or cracking. 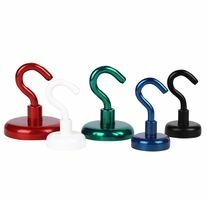 Due to the protective cover on these pot magnets, they are a single sided magnet which allows for a non-destructive and easy solution for attaching and suspending objects. 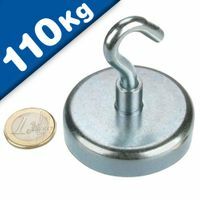 These large clamping magnets provide an astonishing clamping force. The Neodymium magnets are sunken in to a steel shell meaning that the north pole is on the centre of the magnetic face and the south pole is on the outer edge around it. The steel pot increases the adhesive force of the magnets giving them an incredible hold for their size. 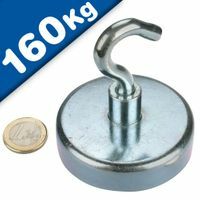 Our range of hook and eyebolt magnets can be easily attached to any steel surface and provide clamping forces of up to 160kg. 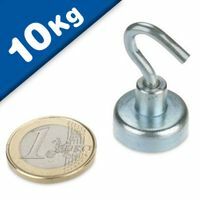 These magnets are perfect for supporting temporary lighting, fixtures or fittings on building and industrial sites. 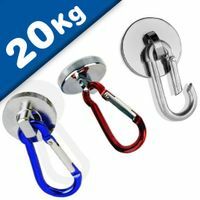 Magnets with removable hooks and eyebolts are ideal for fixing portable lighting to steelwork, holding cables off of the floor on building sites and provide a temporary or permanent hanging point on any steel surface. Our smaller sizes and painted magnets are often used in shops to hold promotional signs that are suspended on wires attached to the magnets which are attracted to steel ceiling beams. 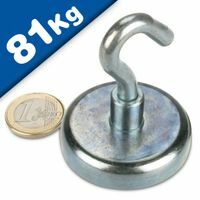 These clamping magnets Neodymium pot magnets with eyelet or hook provide an astonishing clamping force for their size. The Neodymium magnets are sunken in to a steel shell meaning that the north pole is on the centre of the magnetic face and the south pole is on the outer edge around it. The steel pot increases the adhesive force of the magnets giving them an incredible hold for their size. An added advantage of these magnets is that they are resistant to chipping or cracking following constant impact with a steel surface. Not only will the steel pot keep the magnet safe from damages but also the magnetic force is higher! Rare Earth (Neodymium) Holding Pots are essentially a strong magnet sealed within a mild steel cap. 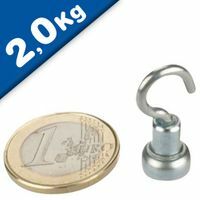 They are designed to hold objects on a horizontal or vertical magnetic surface through a variety of different additions to the magnet, such as threaded hooks, eyelets, or male/female threads. Due to the highly brittle nature of the Rare Earth Magnet, the steel casing is essential and offers reliable protection from erosion, cracking and chipping, as this is quite common with high strength magnets. What’s the benefit of a Holding Pot Magnet? Increased strength and considerable versatility! The steel casing around one side of the magnet suppresses the magnetic field from one side, but instead of eliminating this field altogether, it actually reflects it to come out of the uncovered side. 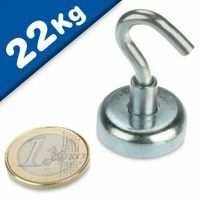 This feature doubles the magnetic force of your average Neodymium magnet and can therefore hold heavier objects from the attached hook/eyelet. Due to their versatility, Magnosphere rare earth pots can be used in many commercial and industrial applications such as keeping doors open or closed, cabinetry, holding, fixing, attaching objects to walls, ceilings, structures, vehicles or any ferrous metallic object or surface. High resistance to magnetic demagnetization. Neodymium Holding Magnets (Threaded hook) magnets are excellent for holding cabling out of the way. 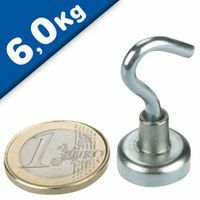 Neodymium Holding Magnets are high strength rare earth magnets in a mild steel cap for extra protection against chipping or cracking. 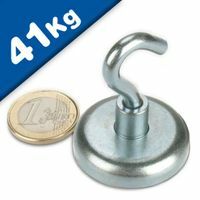 Due to the protective cover on these pot magnets, they are single sided magnets which provide an easy, non-destructive solution for attaching and suspending objects. 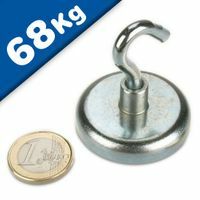 Strong Rare Earth magnets in steel pot casing, with eyelet for safe mounting of objects. 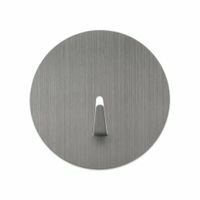 Our eyelet magnets neodymium come in different sizes and are great for attaching and suspending objects. These Neodymium Holding Pots are high strength Rare Earth magnets in a mild steel cap for extra protection against chipping or cracking. Eyelet can be removed. 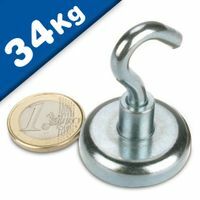 Who supplies high quality Neodymium Pot Magnets for Hooks or Eyelets? Magnosphere offers best priced Neodymium Pot Magnets for Hooks or Eyelets globally to all industries, including Automotive, Aerospace, Military, Advertising, Design House, Electronic and Academic/R&D. Please inquire for custom Neodymium magnets or magnetic assembly. 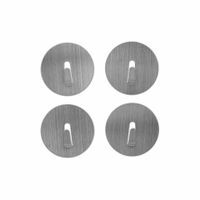 Buy Neodymium Pot Magnets for Hooks or Eyelets at Magnosphere and get a better deal!